The Light Fantastic combines Ike Holter’s brilliantly funny writing with formidable production design that makes the play, directed by Gus Menary, work on several levels. It’s a deliciously spooky thriller with a reverse Faustian twist. It’s an endearing romantic comedy. It a clever send-up of horror genre tropes (I likely missed five references for every one that I caught). And it offers up a refreshingly empowering narrative that hinges on female agency as opposed to the female helplessness the genre has long relied upon. 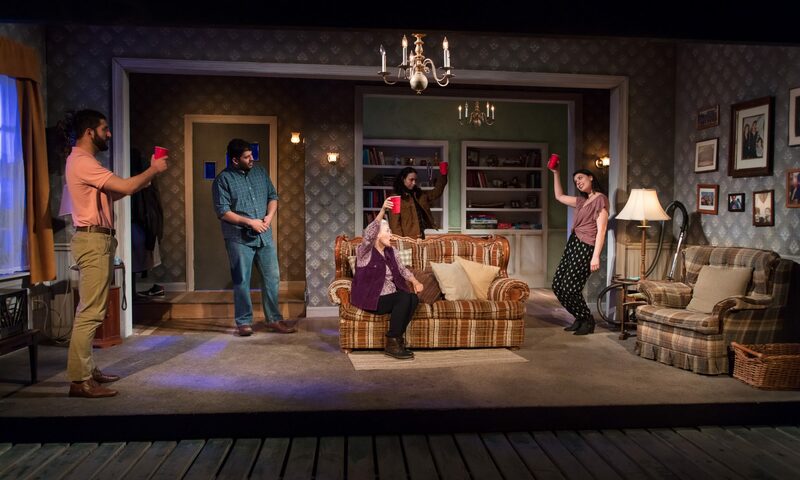 The play also has a strong moral point of view as it touches on subjects as wide ranging as bullying, homophobia, taking advantage of your friends and the grave error of ignoring your mother’s phone calls. On a more philosophical level this play is about characters asserting the right to face death on their own terms as they grapple with Kantian questions of moral duty. The play centers around Grace (Paloma Nozicka) who has returned to her small hometown and installed herself in the house of her sometime lover Eddie (Diego Colón​) a generous, endearing guy Grace seems to be using for free rent. At least that’s what Harriet (Brianna Buckley) assumes when Grace summons her to the house late a night to investigate a mysterious noise. Grace basically ruined Harriet’s life in high school, but now, in a fitting twist of fate, Harriet is a cop and Grace needs her help. There is something seriously creepy going on. Harriet does her job and checks the place out but not without berating Grace for being a user and a bully. As the plot thickens we meet Grace’s mom, Fiona (Janice O’Neill), her mysterious companion, Adam (Tommy Malouf) and a young couple on the run from something bad, perhaps supernaturally bad (Elena Maria Cohen and Andrew Burden Swanson). The ensemble gives strong performances all around. Scenes between Nozicka and Swanson are particularly effective and well-staged. I’d elaborate but I don’t want to reveal too much. It’s hard to frighten people who are sitting a few feet from the stage but Menary and his creative team managed to do a pretty good job of that. The production is bursting with a spooky effects: Steve LaBedz’s sound/projections design and Slick Jorgenson’s lighting design combine to give the audience goosebumps and keep us suspending our disbelief, at least as to the extent that required in a play this self-aware. Similar to Holter and Menary’s collaboration last summer with Put Your House in Order, The Light Fantastic features a would-be couple in a casual relationship at the center of a supernatural suspense story. This setup forces characters to make decisions about how much to invest in each other in a situation where caring has life and death stakes and sacrifices will necessarily be required. Stereotypically in horror sexuality is policed and punished (especially for female characters), but in Holter’s world, indifference and emotional distance are the biggest danger. His characters must break through layers of their own emotional defenses to allow themselves to care about one another as if, well, as if their life their life depended on it. It might sound strange to say that a horror piece is delightful but The Light Fantastic definitely delights as it entertains. I dare not say more except you should see it. The Light Fantastic runs through June 16th at Jackalope Theatre. Photos by Joel Maisonet.